One of the great things about doing motorcycle tours in Timor Leste is that you get to meet some pretty amazing people doing some extraordinary things. In 2011 when I was contacted by Alan Ng from Wheel2wheel, Alan was organising an expedition for an Australian motorcycle rider, Morgan Parker, who was planning to ride his motorcycle from Hong Kong to Brisbane. As if this long ride was not enough he was going to support 10 charities along the way. Given our background in community development and motorcycle riding in Timor Leste, this was an irresistible combination. Alan initially had some questions about routes into Timor Leste and some other logistical matters. Over several email conversations with Alan, reading more about Wheel2wheel we hatched the idea of running a motorcycle rally in Timor Leste as part of Morgan’s visit. 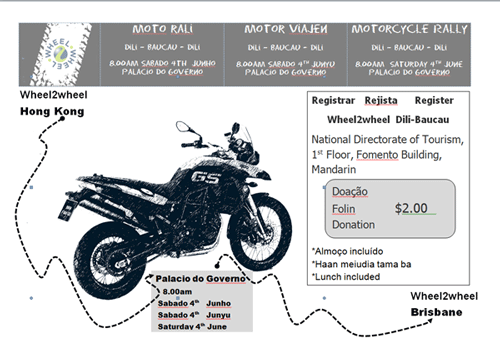 Like all things in Timor Leste we were breaking new ground, this was the countries first motorcycle rally! The logistics of this were complicated; I was in Australia, Alan was in Hong Kong, Morgan was about to go on the road and so the “on the ground” work for the rally was taken up by a small band of dedicated people: Gino Favaro (Hotel Dili), Anne Turner (Freeflow Dive) and Jose Quintas (Ministry of Tourism, Commerce and Industry). Further coordination work was undertaken with Jose de Jesus from the Action for Change, the charity in Timor that Wheel2wheel were supporting. * The rally went from Dili to Baucau, a distance of 136km each way. * In addition to Morgan’s BMW F800GS there were several Honda Mega Pro’s, a couple of Honda Revo scooters, an old Honda CX200 Ag bike and 3 Harley Davidson motorcycles. We all got back to Baucau OK, it was one big amazing day! On ya Alan, well done Morgan and Gino, Anne and Jose….thanks, we could not have done it Timor’s first motorcycle rally without you….together, we made history!